With the Lynx we wanted to design a kite which enables riders to enjoy free ride snowkiting to the fullest. We feel that a free ride open cell depower foil has to be accessible and offer reliable performance in a wide variety of conditions. It has to offer quick and responsive controls without sacrificing the stability you need to enjoy endless fresh powder sessions comfortably and in full control. The Lynx is a medium aspect ratio, open cell depower foil with a 5th line safety that makes back country exploring easy with its user friendliness and versatility. The kite has a very predictable and smooth power delivery and it offers great turning speed to allow for quick redirects or to get going even in lighter winds. 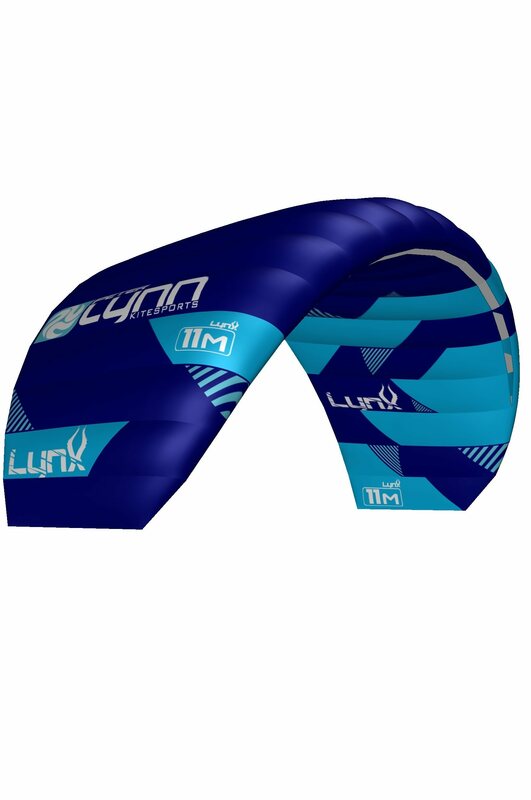 Its superb stability and controllable power build-up make the Lynx a great kite for those starting out while its acceleration and snappy controls allow for the confidence to make quick progression. And its performance in higher winds will put a smile on the face of even the most experienced riders. I chose this kite to get max wind specter for $$, durability, safety and beginner friendly. After a few sessions I must say, it flies in less wind then my previous 12m2 LEI, is easy to launch and fly - when the lines are correct that is. A bit hassle to sort the lines out, though I don't have much experience, it might get easier after a while. One of the main reasons I bought the kite was also safety system and ability to avoid getting overpowered. Indeed it works, but a bit to much, or should I say less. I bought the 9m2 so that I could have a kite for "all" conditions, wind-range on my spot is 0-40 knots and the weather changes quickly. I have tested the safety system several times, it works beautifully. Highest wind I've had so far is only 16 knots though. But I must say I was a bit disappointed in the pull of the kite, I was hoping for a little more. It just doesn't get me satisfied and I can't shake the feeling I want something with more power. All in all a decent kite for the money, if you are in my weightclass and is uncertain for 9/12 - go for the larger one. Hoping to find some stronger wind to test the upper scale of the kite too, hopefully it comes more to its natural element in 16-24 knots. Tested the new Lynx 7m in real hard snowkite conditions. Gusty & boosting winds. I liked the bar feel it was good with nice pressure and feedback. Foils can feel a bit soft on the bar but the Lynx felt direct. The short power stroke forced me to keep the arms bend, personally I like to have a bit longer stroke with feedback & control all the way. Nice was the new 5th line safety system, I used it several times and it worked great in hard winds.